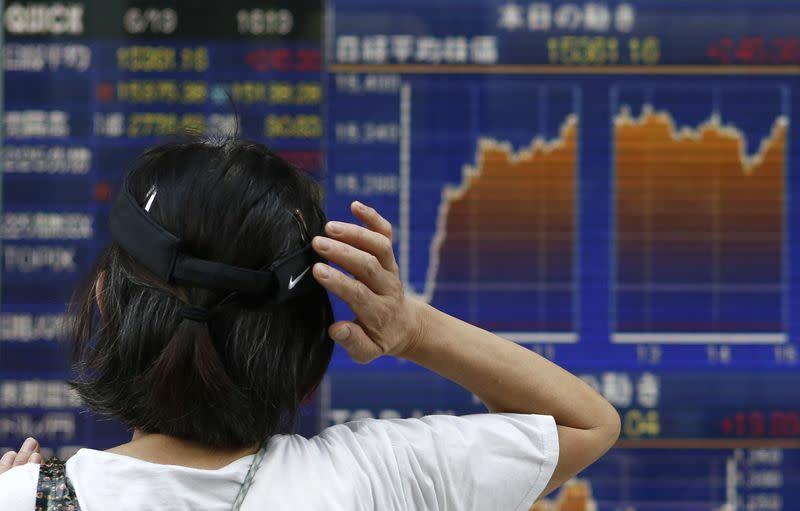 TOKYO (Reuters) - Asian shares rose to a three-year peak on Friday, though the dollar inched away from overnight highs hit on U.S. jobs data which underscored the strength of the economic recovery. European stocks were seen taking a breather after recent gains, with financial spreadbetters expecting Britain's FTSE 100 to open 3 points higher and Germany's DAX to open between flat and 1 point higher, both unchanged in percentage terms. France's CAC 40 was expected to edge 7 points lower, or 0.2 percent. "Given the strong gains seen already this week, and the absence of U.S. markets for the 4th July Independence Day long weekend, it seems likely that we will probably see a fairly quiet end to what has been a very positive week, with European markets set to open pretty much where they finished off yesterday," said CMC Markets senior analyst Michael Hewson in a note to clients. MSCI's broadest index of Asia-Pacific shares outside Japan was up 0.2 percent, touching its highest levels since May 2011 and on track for a weekly gain of 1.7 percent. Japan's Nikkei stock average rose 0.6 percent to hit a 5-1/2-month high, and gained 2.3 percent for the week. "The data is driving investors today, and there is no incentive to sell," said Kyoya Okazawa, head of global equities and commodity derivatives at BNP Paribas in Tokyo. U.S. nonfarm payrolls rose by 288,000 last month and the unemployment rate fell to 6.1 percent. Employment has grown at more than 200,000 in each of the last five months, the first such streak since the late 1990s. The report helped the Dow Jones industrial average pass the 17,000 milestone and the benchmark S&P 500 rise to within 1 percent of the 2,000 level. The data also pushed up the benchmark U.S. Treasury yield to a two-month high, which in turn burnished the dollar's appeal. The benchmark 10-year yield last stood at 2.641 percent, not far from its U.S. close of 2.648 percent on Thursday, when it rose as high as 2.69 percent. The dollar edged slightly down against the yen to 102.04 yen, but remained not far from a two-week peak of 102.26 yen touched on Thursday, when it marked its largest daily gain in a month. The dollar index, which tracks the greenback against a basket of rivals, stood 80.225, steady from late U.S. levels after marking a one-week high of 80.315 in the wake of the jobs report. Recent economic data had painted a more ambiguous picture of the U.S. growth outlook, and had given investors no reason to believe that the Federal Reserve would be hiking interest rates anytime soon. That had pushed down U.S. Treasury yields and dented the dollar. The U.S. unit's outlook hinges on what the Fed does next, particularly after the strong labour numbers, market participants and strategists said. "The dollar's gains look limited considering how strong the jobs data was, as participants are still unsure how U.S. inflation pans out," said Junichi Ishikawa, market analyst at IG Securities in Tokyo. "The possibility of Fed's Chair Janet Yellen shifting to a more hawkish stance has added to the uncertainty. Upcoming data such as retail sales, consumer prices and personal consumption expenditure (PCE) may help clear the mist, if they point to an inflationary trend taking hold." European Central Bank President Mario Draghi sounded a dovish note himself on Thursday at a news conference after the ECB decided to hold interest rates unchanged, adding to pressure on the European currency. Draghi said that risks facing the euro zone economy mean that rates will stay low for an extended period. The euro was down about 0.1 percent on the day at $1.3599, just above Thursday's one-week low of $1.3596. In commodities, spot gold inched down to $1,321.60 an ounce after dropping in line with the stronger dollar, and the record highs on Wall Street diminished its safe-haven appeal. U.S. crude was down about 0.1 percent from late U.S. trade at $103.97 a barrel. It was on track to post its biggest weekly loss in a month on receding worries about supply from Libya and Iraq, although expectations of an improvement in the outlook for demand in the world's top oil consumer checked its losses. Copper was steady at $7,176.25 a tonne after earlier hitting a 4-1/2 month high, and looked set for its biggest weekly advance since September last year.